On April 7, the United States and Thailand kicked off this year’s iteration of an anti-submarine warfare exercise. The development put the spotlight on the ongoing security collaboration between the United States and Thailand within the broader relationship and amid a range of domestic and regional developments for both sides. As I have observed previously in these pages, the United States and Thailand, both treaty allies, have a range of engagements on the defense side of the relationship. On the exercises front, this includes several bilateral exercises such as Hanuman Guardian, as well as multilateralized ones such as Cooperation Afloat Readiness and Training (CARAT), the Southeast Asia Cooperation and Training (SEACAT) series, and Cobra Gold, which is one of the largest drills of its kind in the region. Amid some changes over the past few years, including the election of U.S. President Donald Trump and Thailand’s navigation of its post-May 2014 coup environment, which includes the recent holding of elections, defense interactions between Washington and Bangkok have continued and in some cases even accelerated, in spite of challenges that remain both for the alliance and within the wider Indo-Pacific region. One of those regular bilateral exercises is Guardian Sea. The exercise, classed as an anti-submarine and maritime domain awareness exercise, is largely focused on strengthening anti-submarine warfare (ASW) procedures through a variety of interactions including symposia, planning discussions, personnel exchanges, and at-sea events. On April 7, the U.S. Navy (USN) and Royal Thai Navy (RTN) began the eighth iteration of exercise Guardian Sea. Participating assets, which included a U.S. Navy Los Angeles-class fast attack submarine and underway replenishment oiler, along with two RTN frigates, a corvette, and a Sea Hawk helicopter, were set to participate in over a dozen evolutions, designed to incorporate shared techniques in real-world at-sea environments. This iteration of the exercise saw large elements of continuity, including the range of interactions and the phases within them. But there were also some new aspects as well. For instance, per the U.S. Navy, Guardian Sea 2019 marked the first time the RTN deployed a towed array sonar aboard HTMS Bhumibol Adulyadej, used for detecting undersea contacts including submarines.The exercise also saw the RTN fire a C-802A anti-ship missile as part of the drills. The nature of the engagement reinforced the pattern of evolution in Guardian Sea thus far, which, despite some issues, has nonetheless been growing in complexity in some ways over time. And though it is only one among the many security-related engagements both treaty allies have between them, it remains one to watch to get a sense of where defense collaboration is and where it is headed. The interaction will spotlight the state of the alliance and the challenges both sides face in managing it this year and beyond. 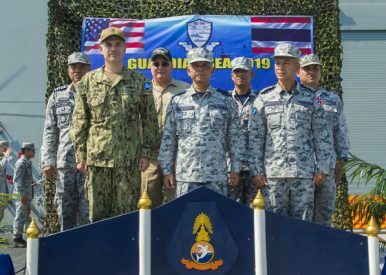 US-Thailand Anti-Submarine Warfare Exercise Kicks off in Andaman SeaWhat Will the 2018 Cobra Gold Military Exercises in Thailand Look Like?Thailand-Philippines Defense Ties in Focus With Navy Goodwill VisitStrengthening the US-Thailand Alliance for an Indo-Pacific FutureWhat Does Thailand’s 2019 Defense Budget Mean?